Broadcast quality playout automation solution. Component card and software. Video play-list with multi-level output scenarios. Play-list editing during playback. Complex information channel layout including multiple scalable frames, creeping lines, animated logos and fields for text and graphics. Automated SMS chat and SMS voting system. Automatic audio and video signal commutation. Playback of video files from local HDD, CD, DVD, RAID or Network Attached Storage. Clip transfer over the network without any traditional video information carrier application. Uncompressed video file (4:2:2) playback with D1 quality without the 4.0 Gb size restriction. 32 bit 4:4:4 type animation files playback for creation of animated logo moving over the screen area as an alternative to the creeping line. Logo superpositioning on video files as a separate layer in real time mode. The Preview function allows to preview user-made schedules on a control monitor. Compatibility with popular offline editing systems, using DV and MPEG format. Insertion of clips in a passing-through video signal without video mixer, synchronizer, or a non-linear editing system. Automated commutation of audio and video signals in various types of computer modules. Compatibility with popular non-linear editing system using DV, MPEG-2 and MJPEG formats (Pinnacle DV500, miroVIDEO DC30 and DC50, Matrox RT-2500, Matrox DigiSuite and many others). Control of the transcoder-synchronizer (switching up to 3 channels without synchronization tearing) allows to insert video modules into the broadcasting sequence using two video and audio signal sources, e.g. for consecutive switching between the local and central station signals. Brightness, contrast, color saturation, and sound volume can be adjusted individually for each video file 'on-the-fly', as the file is registered with the event planner. MPEG-4 and DivX video files can be scaled 'on-the-fly', as they are replayed. The card has completely digital path of image shaping. It ensures better quality of the shaped signal and a better tie-in to input signal. 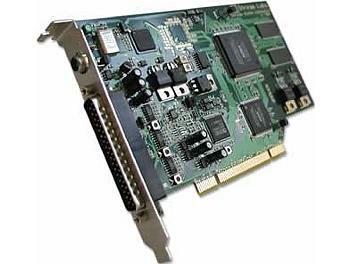 The principle of inserting graphics into the passing signal without decoding is used in this card. The unique feature of the card is employment of a soft key signal in the process of working with a composite signal. That enables inserting a computer image into composite signal staying within brightness channel boundaries, avoiding color distortions (cross color) at the video-computer graphics boundaries. Apart from analog mixing, digital mixing was added to the list of functions providing input signal decoding. The card can be switched from passing signal mode to decoding mode. Though decoding and subsequent encoding introduces an essential delay (about 10 milliseconds), it allows a selection of input and output standards, and lower input signal quality requirements keeping high output signal quality. In the course of graphics insert into the signal passing through the card without decoding sound signals and all support information pass intact. Graphics superposition over the passing signal is effected with the use of alpha channel with a palette, making it possible to regulate transparency level for every image point. Palette enables changing this transparency in the course of work, for example for applying Fade in/out effects without alpha channel copy. The card has a stand-alone synchro generator that switches on automatically in absence of a synchronizing signal. On computer switch off or if BYPASS mode is on for all devices input and output are locked through the relay, the 75 Ohm load being switched off. The software, operating under Windows, enables creating scenarios (title sequences to be output with various effects) and play them back through the device for computer graphics superposition over TV/video signal. From the user's point of view it resembles a multi-window text processor, in which several scenarios can be edited and kept ready for output simultaneously. Besides, the same scenario can be opened in several separate windows, which simplifies text changing procedure in its various parts. A scenario is paged, number of pages being unlimited. An individual video effect is related to every page determining its appearance, motion and fading out from video screen. The following effect types are supported: vertical text moving from bottom to top, Drum, Roll, infinite page moving horizontally from right to left (Creeping Line), Crawl, static page Cross Fade with a pause for display, Wipe, including user-defined, with adjustable transition softness, animation playback over static pages, effects with operating areas restricted to a certain part of the screen, animation symbols in Roll or Crawl pages. User-defined parameters for video effects are application area, speed and delay duration. The software provides for object management be external applications, including user developed programs. That comprises programs written in Microsoft Office VBA script language, including Word, Excel and Access scenarios, programs in Visual Basic, Web-pages containing scenarios in VBScript, and programs written in Delphi and Visual C++. That enables the user to play back the required pages at the required moment with program modifications in the course of playback (for real-time presentation of any information input to the computer). If computers with video cards are connected into a network, centralized output control from one program is possible. Broadcasting arrangement design is set up in the form of templates that may be prepared beforehand and/or edited on air. Real-time data are merged into the template immediately at the playback moment. A function is provided for automatic screen update synchronously with input data updates. A system of any capacity may be constructed out of standard equipment (IBM PC, video cards) and can be reconfigured if necessary. The user edits templates as desired and if necessary can write his own Visual Basic, VBScript or VBA programs for his specific tasks. Using VBscript language in-built in the Internet Explorer it is possible to concentrate program control within one or several HTML pages comprising text boxes and operation buttons. For example, the textbox Surname and two buttons, Show and Hide. Through writing the appropriate scenario and preparing Alpha Pro page templates it is possible to set exactly the design style (background, font for surname display) and effects for its appearance and fading out. That way we get the control panel without distracting foreign control elements. Having prepared page templates based on broadcast design style and written the management scenario in Visual Basic, it is possible to broadcast appropriate pages at the right moment making software changes directly at the moment of broadcasting (for real-time presentation of any input data). It solves the design problems of sport translation, game shows, etc. The same approach enables telephone polling broadcasting by installing required amount of modems into the computer or using a dedicated card for the purpose. With a high-precision time-code source in SMPTE/EBU format it is possible to program schedule of page broadcasting time specifying calendar functions and precision up to one frame, which enables automated airing simple commercial inserts (creeping line, logo, animation logo). User interface (HTML page) can be tailored by yourself so as to exclude all incidents in the course of broadcasting, keeping strictly necessary functions only (title text choice from the list, broadcast title, hide title). The software intended for automatic playback of logos, titles, animations and video clips on the schedule. It is recommended for automation of a TV company broadcasting, and for integration of regional commercials and broadcasts into the network television broadcasting timetable. It enables converting your title generation station into a real video server keeping its title creating capabilities intact. The program makes it possible to combine source video files into video blocks with the help of the simplest editing tools (clip trimming, line editing) and also correct some video clip visual parameters (brightness, contrast, saturation, etc.). Moreover, the files in the block can be played back not in full, but in fragments, i.e. a block can comprise different video clip fragments following at random. The system also produces logo superposition (including dynamic logo) and pointer clock over video files played back. Another block variety is SC/Audio blocks. Video and audio track content is filled separately and independently. SC/Audio video track is a train of files containing titles of SC type. Their total duration determines SC/Audio block duration. DV type 2 (720x576), 4:2:0, compression 1:5, 32/44/48 KHz stereo audio no 4 GB limit AVI file produced by most non-linear editing cards supporting the DV format. MJPEG (720x576), 4:2:2, compression up to 1:3, 32/44/48 KHz stereo audio format produced by miroVideo DC30/DC50, Matrox DigiSuite/DigiSuite LE, Fast AVMaster cards. DivX, MP-4 (720x576), 4:2:0, bandwidth up to 10 Mbps, 32/44/48 KHz stereo audio no 4 GB limit AVI file produced by the DivX codec or its analogues in compliance with the MP-4 specification. MP-2 (720x576, 704x576, 512x576), 4:2:0, bandwidth up to 10 Mbps, 48 KHz stereo audio MP-2 Main Profile file (compatible with DVB, Digital Video standards and most hardware coding devices in MP-2). MP-2 I-frame (720x576), 4:2:2, 32/44/48 KHz stereo audio (or in a separate WAV file) no 4 GB limit AVI file produced by Matrox cards, series RT-xxxx. Uncompressed video files type 422 provide the highest D1 video quality (720x576x4:2:2) and the 48 KHz stereo sound format and have no 4GB size limit of AVI files. Animation file type 444 does not include sound; 720x576x32 bits resolution; unlimited duration. Used for production of animation logos, presentations and advertisement banners; created by a converter of TGA 32-bit file sequences. Alpha Pro SC files standard script files of the popular Alpha Pro AE v.2.0 character-generating software. The video resolution should be 720x576, and the frame rate - 25 fps. For instance, Indeo, Microsoft MP42, Canopus v.2.8 (for replay of Canopus DVStorm, DVRaptor RT files), and other formats can be used.